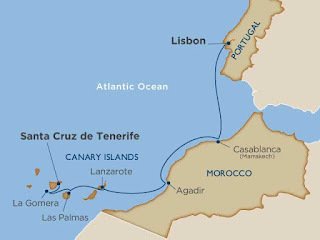 Two of our stops on the Windstar cruise were Agadir and Casablanca, Morocco. As a Jew, I had mixed feelings about visiting a Muslim country. We decided to stay on board ship in Agadir except for the included Windstar private excursion being held that evening. During our stop in Casablanca, we decided to take the ship's excursion to Rabat, the capitol. The private excursion in Agadir was fantastic. We were taken to a beach by bus where tents and tables were set up. The walking area was covered by multiple carpets so we didn't have to step on the sand. We had a delicious multicourse dinner, with as much beer and wine we wanted (remember this is a Muslim country ....), entertainment and a beautiful sunset. Food was beautiful presented and we had a lovely evening. And as beautiful and amazing as everything was, even more jaw-dropping was the bathroom area! Next day we were off to Rabat. I'm glad we took this excursion because we learned a lot about the country. If the tour guides can be believed (and we heard the same from others who took tours), the people absolutely love their king. He is working very hard to improve the financial status of the people, building new apartment complexes to be rented at very low cost to those now living in slums. (Which we saw lots of on our way to Rabat, and surprisingly, each slum complex had an amazing number of satellite dishes!) The country is very ecumenical and Sultan Mohammad V defied the Nazis during WWII in regards to the Jews. Currently there are about 3,000 Jews in Casablanca with three active temples. We even passed one on our way back to the port. Rabat is the country capital and we saw a few government buildings. Disappointed that we couldn't go inside. But we also visited the tomb of Mohammad V which was quite beautiful. Our next stop was the old walled part of the city, where we had a chance to wander around some gardens, browse in shops and have some refreshment while sitting at a river overlook. Our ride back was along the seashore, with many beautiful vistas and where we could also see the construction of more public works projects ... like playgrounds, parks, and even a skateboard park.